The snow was thick and deep, weighing down the branches of the trees and bending them at unnatural angles until they bowed down to the ground. 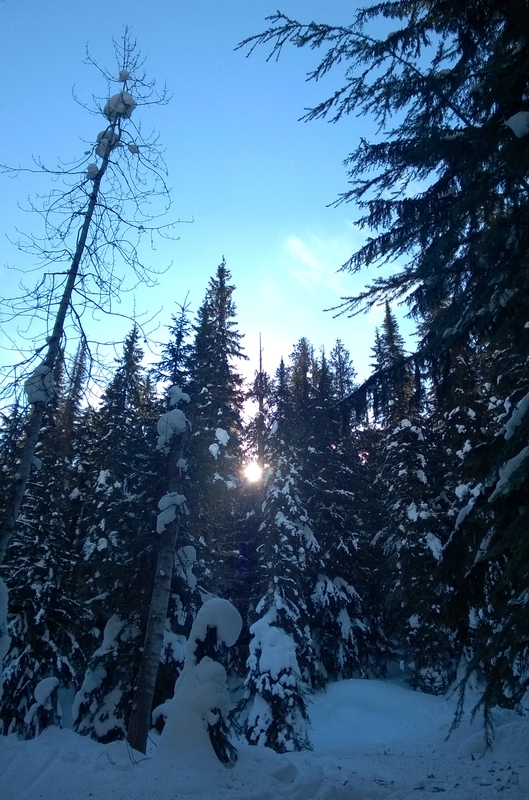 The sky was clear with the sun shinning bright, though the sun beams had a hard time breaking through the thick forest covered in a generous layer of white frosting. 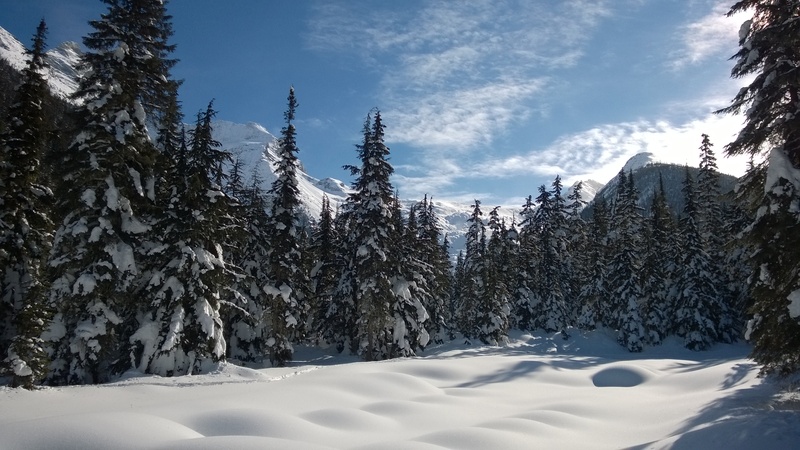 I could see a few jagged mountain peaks in the distance as I trekked along a well trodden path in my snowshoes. I was out with my family for the day, exploring the stunning Glacier National Park near Revelstoke, Canada. 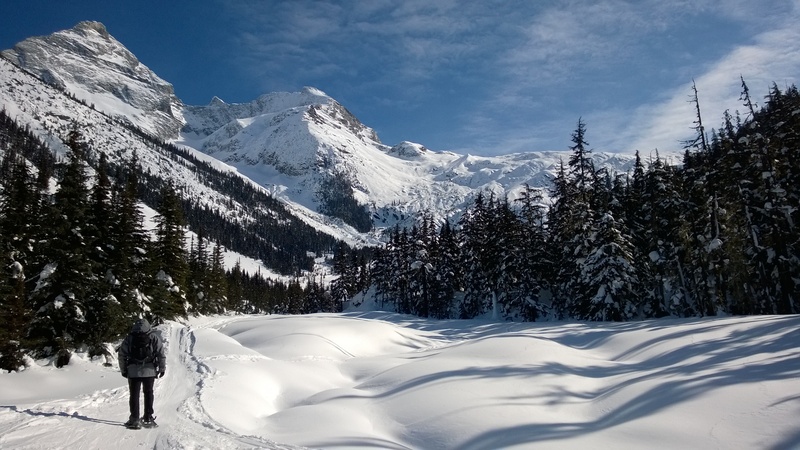 We’d made the 1 hour drive from my parents house in Revelstoke to the Illecillewaet campground entrance of the park to do a day of snowshoeing in the mountains. Glacier National Park (GNP) is Canada’s second oldest national park and one of seven in the province of British Columbia. Located in the Selkirk’s, part of the Columbia Mountain Range, it lies just west of its famous sister, the Rocky Mountain Range. Consisting of over 130 glaciers, this is a park that makes you feel lost in the immense wilderness of western Canada. As we made our way deep into the mountains, we came to a bridge that had so much snow piled onto it that the guard rails were non-existent. The small glacial stream flowing beneath the bridge was barley visible under the pillows of snow that lined its banks. We followed the winding trail beside the buried stream and soon the forest began to open up, showing off the stunning mountain peaks. In no time at all we were at the very base of the mountains and my curiosity took over as I wonder what was on the other side of this natural boundary. We found a nice patch of snow that was protected from the light wind sweeping down the mountains and enjoyed one of the most scenic lunches I’ve ever had. Turning around to start the trek back to the car, I felt as if I was inside a very large snow globe. Mountain peaks, sunshine, snow and forest in every direction, making a large natural bubble world that contained only us. Near the end of our adventure we came across a snow measuring stick. These large meter sticks are there to measure the snow depth throughout the year. 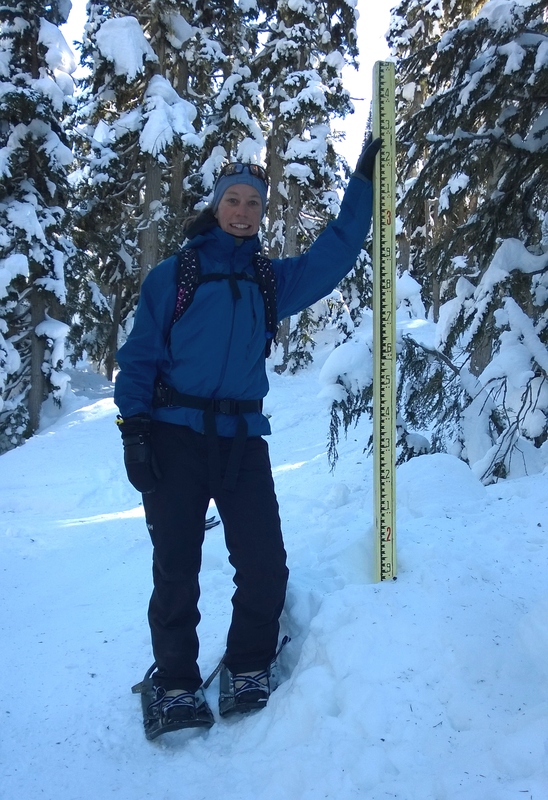 Today the stick told us that we were standing on top of nearly 2 meters of snow pack! 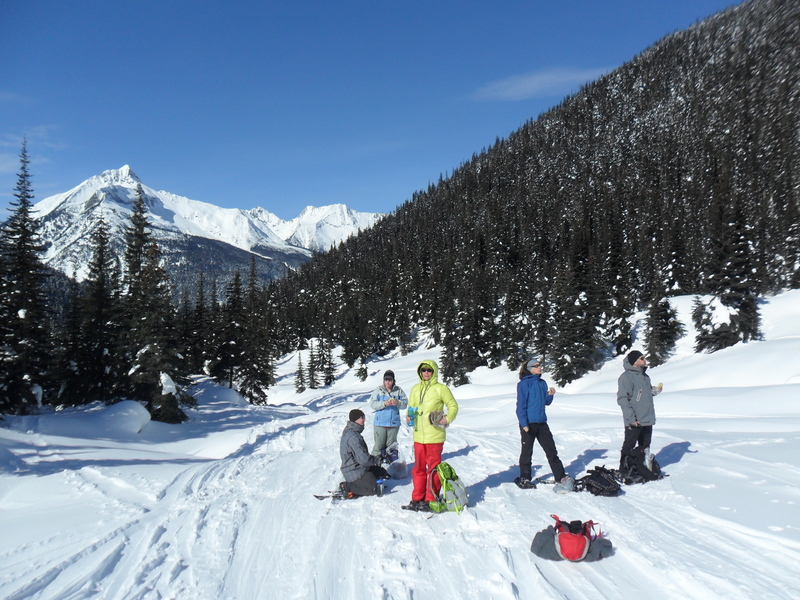 Snowshoeing in Glacier National Park was one of the highlights of my trip out west! 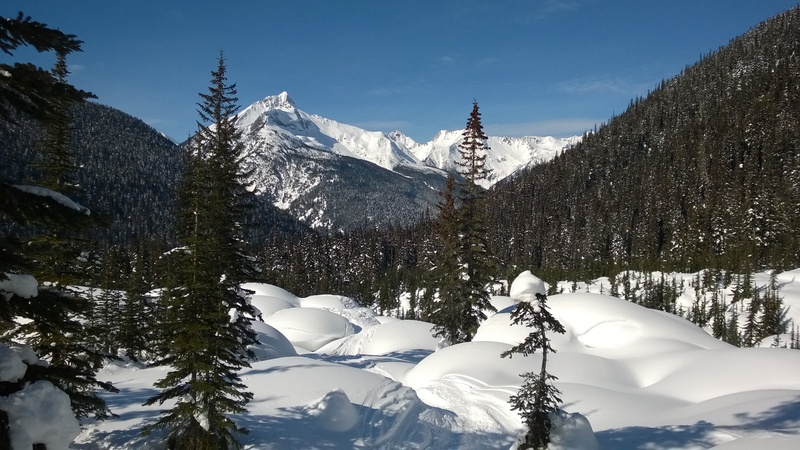 Exploring this natural winter wonderland left me feeling small in the vast expanse of one of the world’s largest mountain ranges. Can’t wait to see what this winter brings when I return to the mountains! Have you ever encountered this much snow before? Where’s the most scenic place you’ve ever had a meal? These photos are just so magical! Thanks! And yes that day was particularly nice with the sun shining on all the snow. It felt magical just being out in such a stunning place! You’ll have to do some snowfield exploration some time! That was great, Jill! I loved the recollection of a fantastic day with your words and photos. Thanks! It was fun to write about!